Artwork by Mia Weinberg - "Threading the paths of my synapses II"
Amicus Music Duo Live: Improvisations was not intended. It was created in the spirit of spontaneity and being present in the moment. Living in the moment frees us from past regrets and fears of the future. The Arts are a powerful access to being in the moment, and the perfect moments for every musician and for every music lover are those when time dissolves. None of the music in this recording was planned, none of it scored or rehearsed, none of it arranged. Except for two brief musical quotes, all that you will hear was spontaneously composed in the moment. We did plan some things…the keys in which we played and a variety of sources of inspiration. The track Bella Mia was inspired by Mia Weinberg’s beautiful artwork (as featured above in this post). Objet d’Art was inspired by a conversation with our audience about a pattern on the ceiling. East Meets West was inspired by the Madhavamanohari Raga (a South Indian scale). Since 2011, we’ve recorded all our performances in Vancouver and Qualicum. 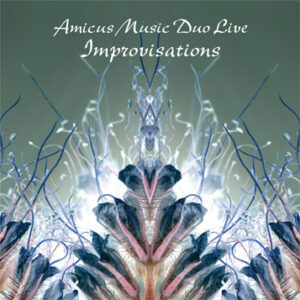 These archives were meant for us, but since so many audience members have asked for them, the favourite improvisations are about to be available for you on Amicus Music Duo Live: Improvisations. There are reminders that these are live…a little siren here, a mistuned piano there, a quiet cough here, a little squeak and rumble there, and varied acoustics. Audience members have graciously shared their heartfelt views about the beauty, surprise and engagement in Amicus improvisations. We’ve chosen those recordings which best reflect these enthusiastic views.